Pisces is gentle, patient and malleable. They are generous, friendly, good natured, kind, compassionate, sensitive to the feelings of those around them, and respond with the sincerest sympathy and tact for any suffering they might encounter. They are very popular with all kinds of people. This is partly because their easygoing, affectionate, submissive natures offer no threat or challenge to stronger and more outgoing characters. They accept the circumstances in which they find themselves rather than adapting the situation to suit themselves. They patiently wait for problems to sort themselves out rather than taking the initiative to solve them. They are more readily concerned with the problems of others than with their own. Withdrawing into a dream world is often the refuge for these individuals. Sometimes these qualities can bring mental satisfaction to them and at times even fame and financial gain through their imaginative and artistic gifts. Versatile and intuitive they have quick understanding, observe and listen well and are receptive to new ideas. When all these qualities combine, they can produce remarkable creativity in literature, music and art. Some of their best work comes from outside themselves through their mediumistic qualities. This ability can be channeled into creativity or a deep appreciation of beauty in art and nature. Add to this a catlike appreciation of luxury and pleasure and a yearning for new sensations and travel to remote, exotic climes and you are in the presence of the true Pisces. 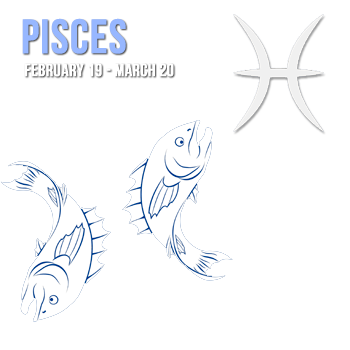 Pisces is rarely egotistical in personal relationships, they give more than they as from friends and family. Most would gravitate to a relationship in which the partner's mind and spirit rather than the body resonated with their own. Unfortunately they can be easily misled by a lover who courts them gently then makes them unhappy by a coarser physicality than they expected. They are nevertheless intensely loyal and home-loving and will remain ardently faithful. In their employment Pisces are better working either by themselves or in subordinate positions. They are intensely individual and would be afraid to manage more than a small department, worrying that they couldn't perform well in a crisis. They can make excellent secretaries and bookkeepers. Imaginative to the extreme, their creative energies and talents are best tapped to the profit of their employer. Their compassion equips them for work in charities catering to the needy such as nurses looking after the sick or veterinary surgeons caring for animals. As librarians or astronomers they can satisfy their mental wanderlust. Their fondness for "faraway places with strange-sounding names" may turn them into sailors or travelers of legend. Many architects and lawyers are Pisceans, and when the creative abilities are combined with gifts of imitation and the ability to enter into the feelings of others, these individuals find their fulfillment on the stage. Their psychic and spiritual qualities can lead them into careers in the church or as mediums and mystics. They may find an outlet for their creativity as caterers. Pisces are said to make amazingly good detectives because they can imagine themselves in the minds of criminals and understand how they would work. In technical occupations they are well employed in dealing with anesthetics, fluids, gases and plastics. Because of their lively versatility and inability to focus very well on any one project, Pisces can often multi task and follow more than one occupation at the same time.